"Don't you wanna feel your skin on my skin?" Yes, Brandon Flowers. Yes, I do. Two very different concerts. Two very enjoyable nights. This was the fifth or sixth time I saw The Killers and the third time I saw them headlining. All other times, yummy Brandon was seriously off-key. No matter, though. The shows were still, dare I say, killer. Flowers is a good showman, prancing about in his snug little vest and gesticulating like a conductor. It wouldn't matter if he were singing commercial jingles; it'd still be a sweet show. Damn, he's cute. But Monday was really great. For once, my dear Brandon Flowers had decent pitch! Maybe he got some singing lessons, or he'd had enough practice from the first leg of the tour. Whatever it was, the better singing made the night all the more enjoyable. Mix a passable voice with lights, machine-powered confetti, and some tight pants, and you've got a recipe for good times. We got our tickets from a friend who has ties with the Staples Center. They were really good seats -- quite possible the best seats I'd ever had at a Staples Center concert. When we sat down, we noticed we were surrounded by old people and kids. Strange. What the hell were these straightlaced extended families doing here? Then we saw all these peeps had backstage access tags. We were sitting with the band's family. Thus, while my boyfriend Brandon Flowers was excellent onstage, my favorite part of Monday night was actually watching Grandma sing along to every song. And...she clearly had the same fave songs as I do. ("Read My Mind" and "All These Things That I've Done," if you're curious.) Classic! Fast forward to Tuesday night. No Grandma at The Forum, but we had great seats again -- front row, in fact. As a lazy old bum, I love it when I can sit and still see the show without people in front of me standing up. The only peeps "in front" of us were the general admission kids in the pit. Ah, the pit. I can't believe I used to do that. Nuts. The thing I love most about Muse is that they're phenomenal musicians. Last night didn't disappoint. I'm not sure if non-musicians really appreciate how talented these guys are. Muse makes me thump inside. The music moves me. Wow. That was hokey. I take that back. It was...um...really loud bass. Yeah. My faves are the songs with elaborate piano and guitar solos. This is the third time I've seen Muse, and I still marvel at Matthew Bellamy's prowess on both the piano and the guitar. 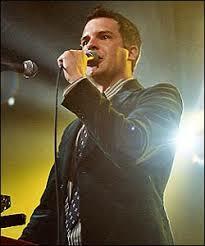 He's so amazing, and, like Brandon Flowers, he is quite the charismatic performer. Bellamy is not nearly as flamboyant and over-the-top as Flowers, but he does exude a certain bravado and has this awe-inspiring swagger when he's playing. Mind you, this is especially impressive, as Bellamy is, in the words of the hubs, a "tiny guy." I'm talking 5'6" or 5'7" at best. I love love loved "Butterflies & Hurricanes" (my fave Muse song), mainly because I love watching Bellamy's fingers fly on the keys. Of course, "Starlight" was a crowd-pleaser during the second encore, as was the sing-a-long to "Time Is Running Out" during the first encore. (What's up with two encores these days? Maybe it's the norm now.) I must say that the Muse audience was far better than The Killers audience, insofar as appreciation of the music (well, except for Grandma -- she appreciated the music more than anyone else in all of Staples Center). You could tell everybody there really really liked Muse. A lot. You'd think, with two concerts, I would've been smart and worn earplugs. I can't hear a thing today. Whoops.